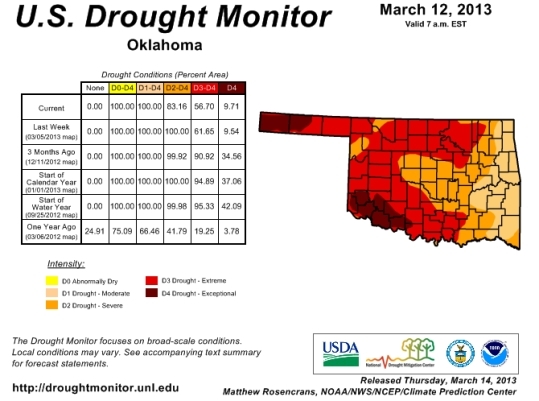 The latest drought monitor map for Oklahoma shows the coverage of extreme to exceptional drought has decreased from 67 percent to 62 percent in the last week. The state now sees a significant amount of the state, 17 percent, that has improved to moderate drought conditions for the first time since December. Unfortunately, there was a bit of expansion in the exceptional category in far southwestern Oklahoma, which has missed out on the recent relief. The latest changes are prompted by last week's storm system that hit the northwest and southeast after skipping much of the rest of the state. Statewide, year-to-date rainfall averages 3.78 inches, about .61 inches above normal or 119 percent of normal. February 1st through March 14 ranks as the 14th wettest such span since 1921. The forecast looks fairly dry for the next 5 or 6 days, but there is a storm system lurking a bit after that, just now starting to show up on the 7-day rainfall forecast.